It was the Midwest life of the small town of Richmond in the 1890’s that gave inspiration to this popular cartoonist’s work. He took in the life around him, the traditions and customs, giving him the source of his subject matter for his publication, Among the Folks in History. 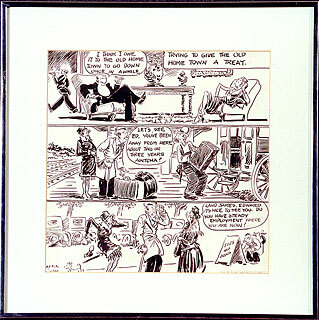 Many locals recognized the scenes and characters depicted in these comics. As the staff artist for the Richmond High School magazine, Argus, Mr. Williams did his first cartoons. He studied at the Cincinnati Art Academy and at the Art Institute of Chicago. He served as the staff artist for the Chicago Daily News and the Indianapolis News before settling in Chicago permanently to work for the Chicago Tribune until his death in 1935. Williams was credited with paying more attention to the “common man”, his struggles and fears as apposed to the grand issues of the day. No doubt growing up in the small town of Richmond, gave him insight and understanding of the American culture. By the time of his death, his cartoons could be seen in thirty-nine newspapers around the country. An edited excerpt from the silent 1931 promotional documentary, "From Trees to Tribunes," - Gaar Williams is the 2nd featured cartoonist.